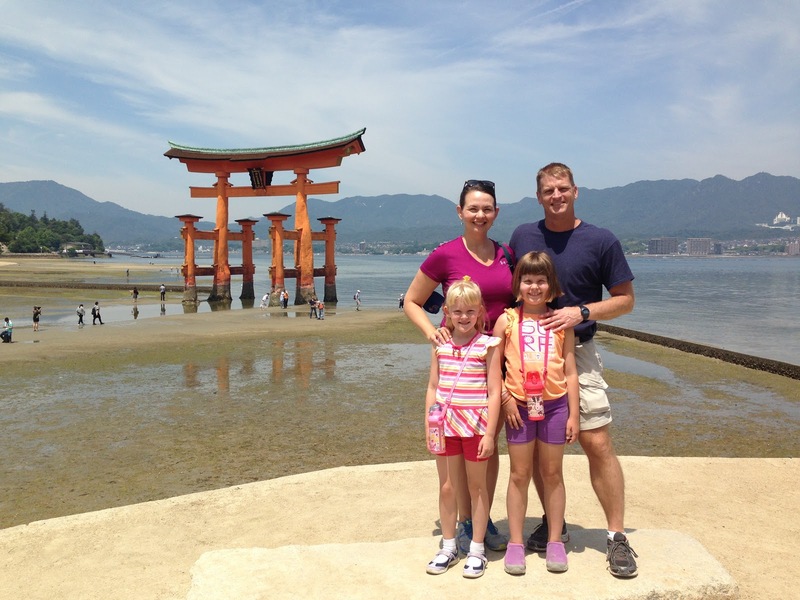 Our first day in Hiroshima was spent at Itsukushima Island, known as Miyajima, (or “shrine island), to the locals. 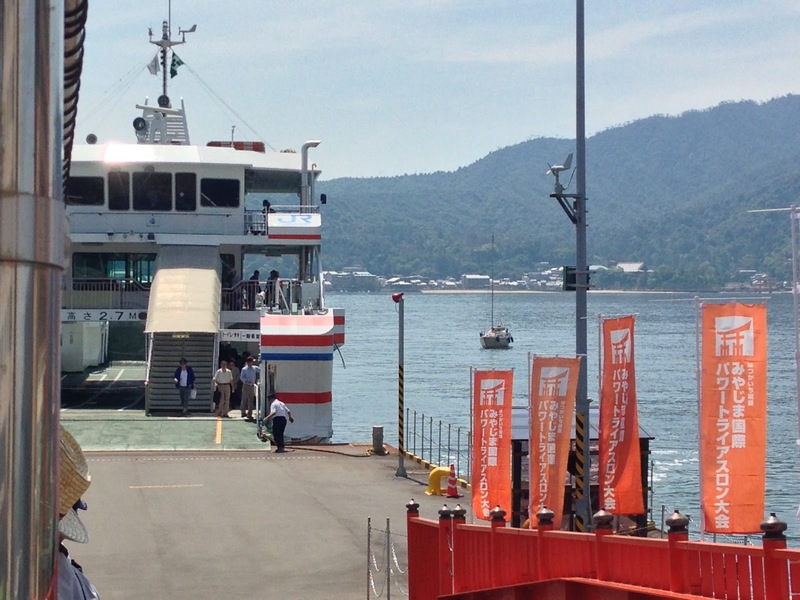 It is about 30 minutes outside of downtown Hiroshima and you get there by ferry. 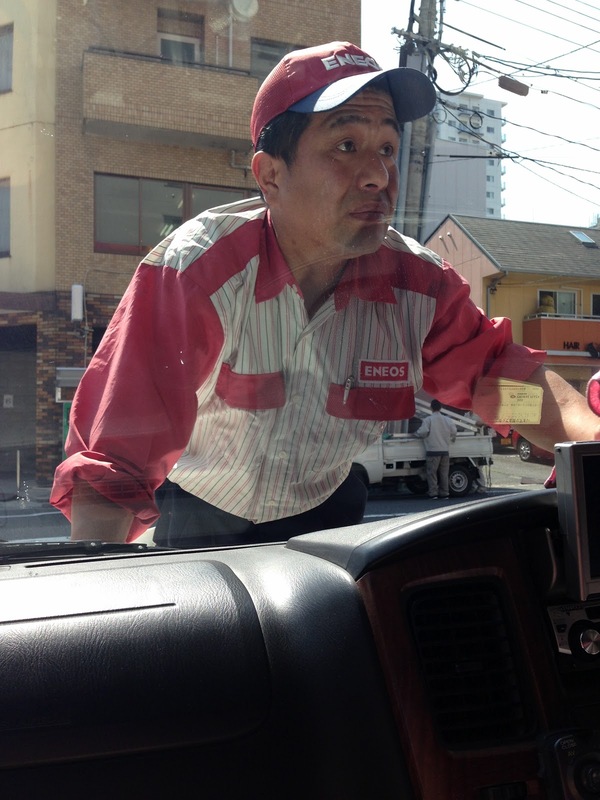 We made a quick stop for gas at a full service station and this man scrubbed and scrubbed the windshield, working at all the dried-on bugs, until the window was spotless. It looked like we had just pulled off the showroom floor when he finished! I don’t know how “attention to detail” becomes a cultural trait, but it sure is here. 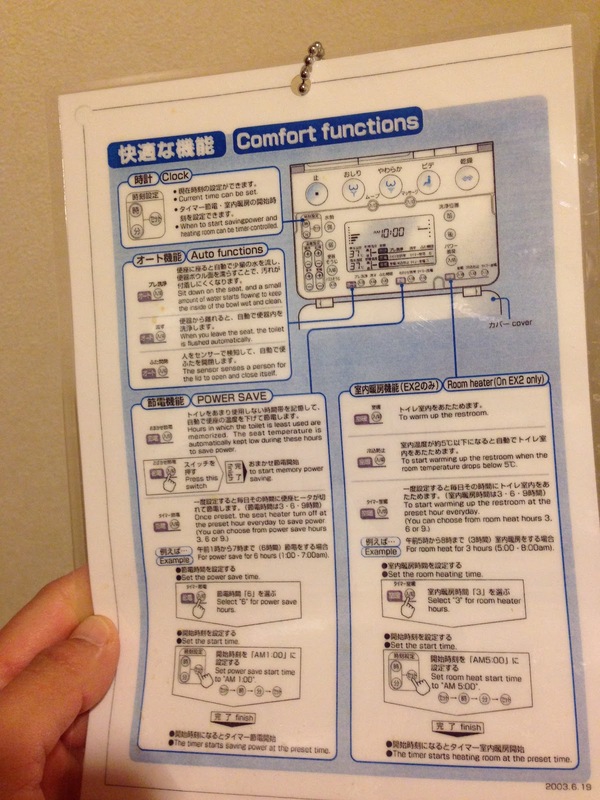 The Japanese take pride in everything they do. 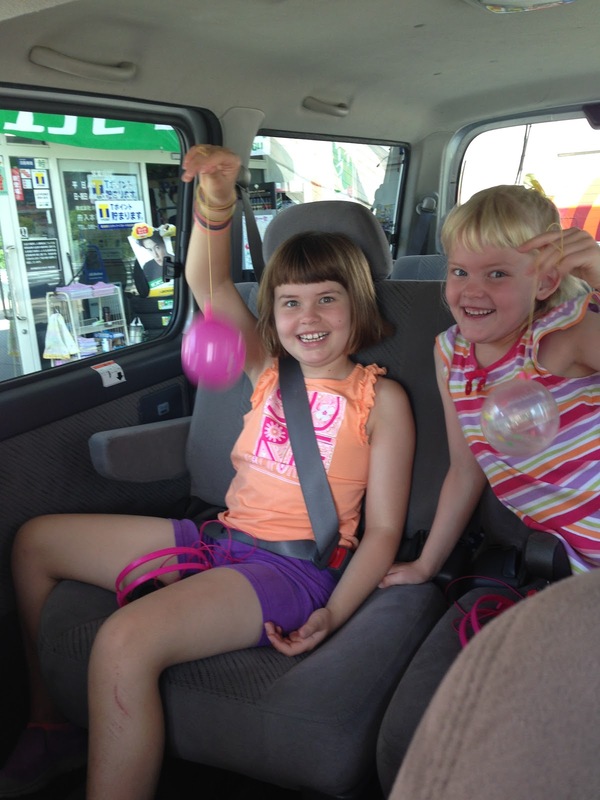 Then, another nice employee came running out with these balloon yo-yo’s for the girls. We were off to a great start! 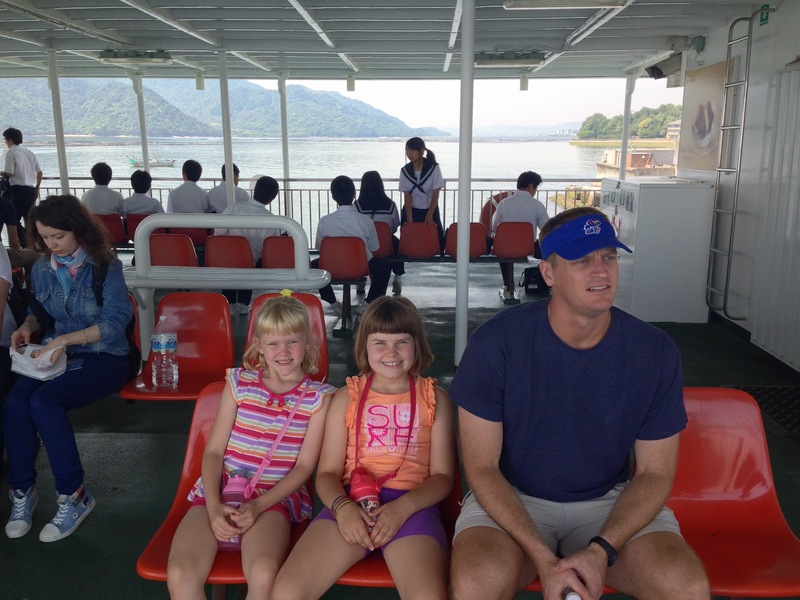 We made it to the ferry terminal, for the 15 minute ride across the bay. 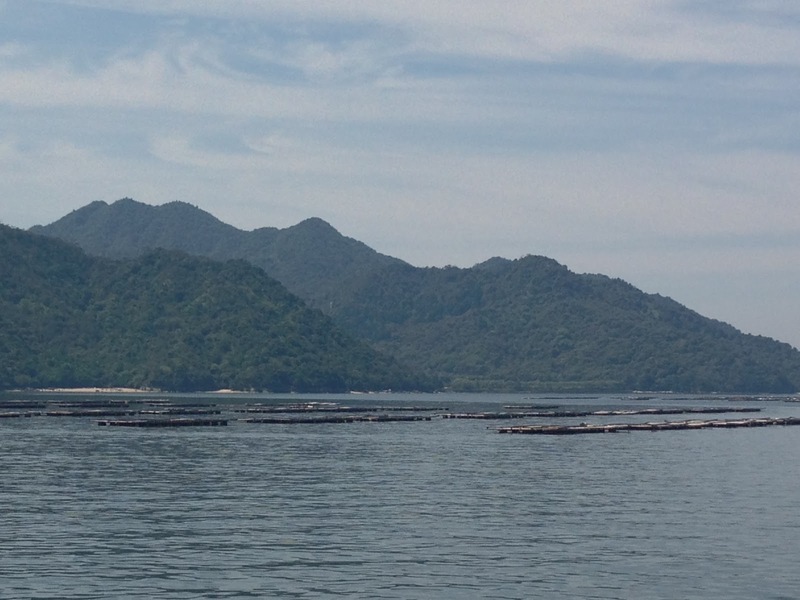 The Hiroshima area is a large producer of oysters, so we saw lots of wooden structures, that looked like docks, along the route. 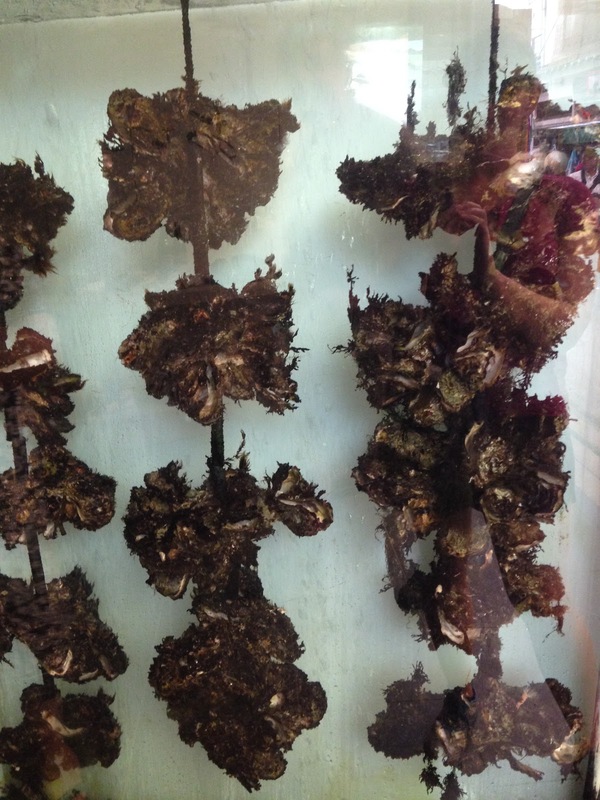 The oysters are suspended under the docks, which apparently promotes faster growth. 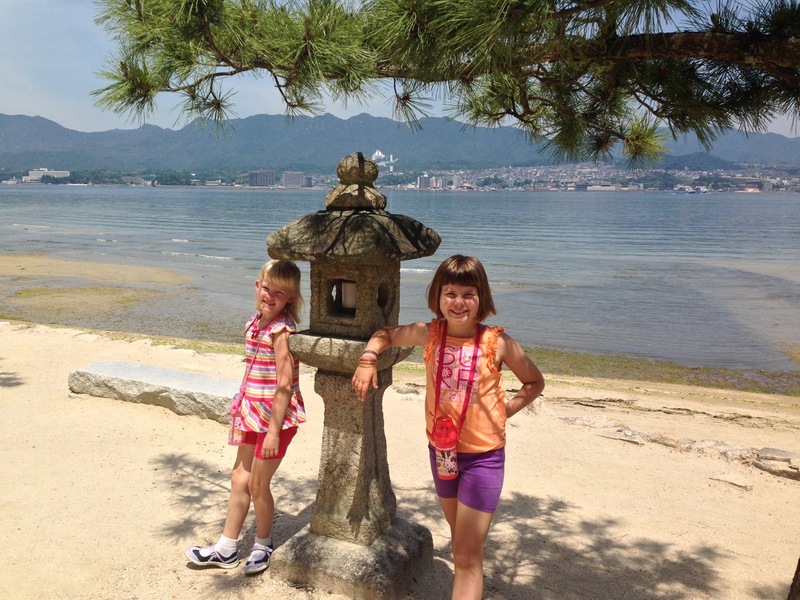 Miyajima Island is made up of many hiking trails, shrines and also a few small hotels, restaurants and shops. 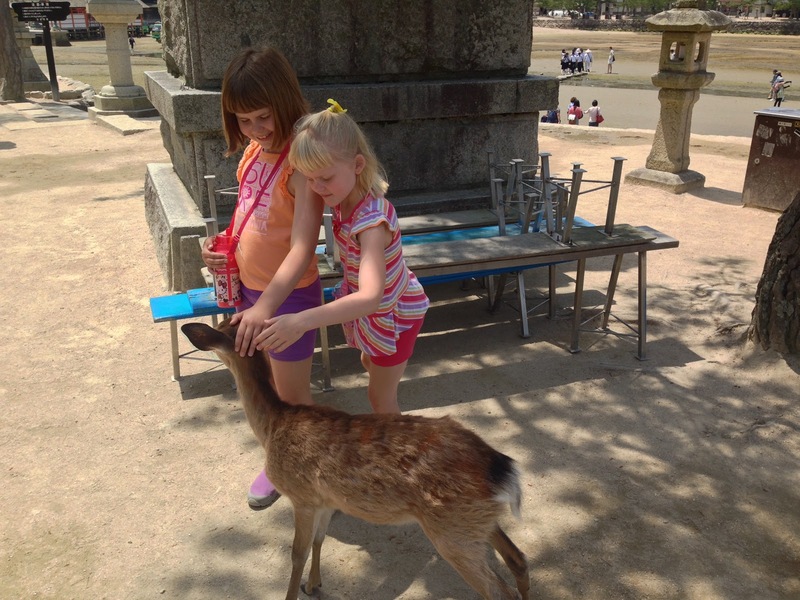 Many deer also roam freely around the island. They are very tame and you can even feed them and pet them. 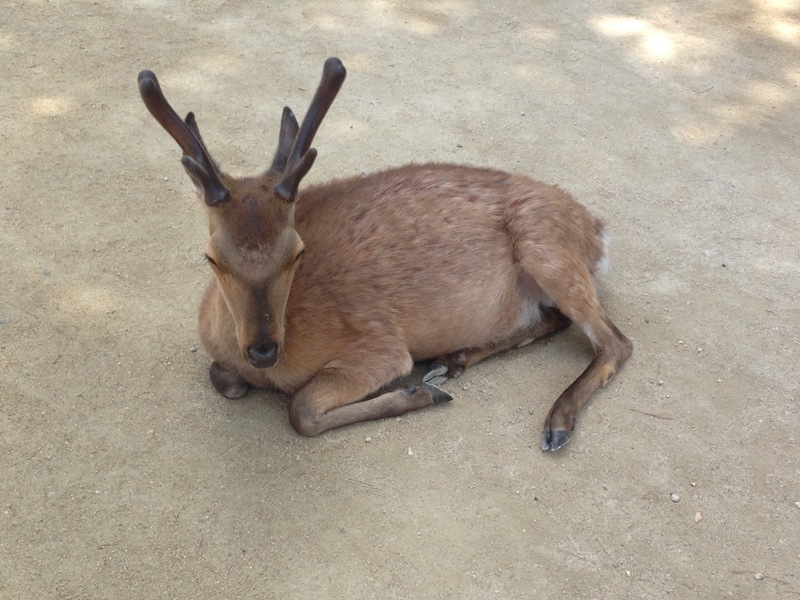 The deer are thought to be the “messengers for the gods”, and are therefore revered. The girls really enjoyed this, but it kind of grossed me out! 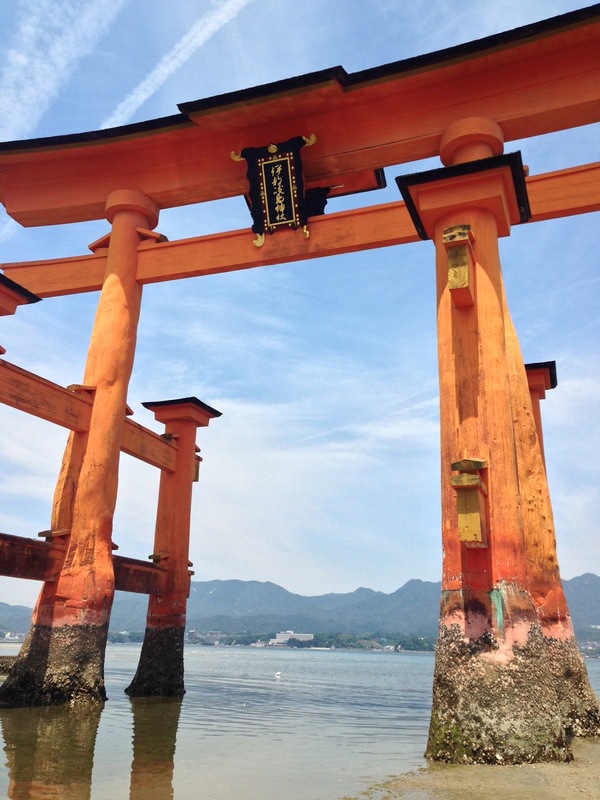 The most popular sight on the island is the famous Itsukushima Torii gate, or “floating torii”. 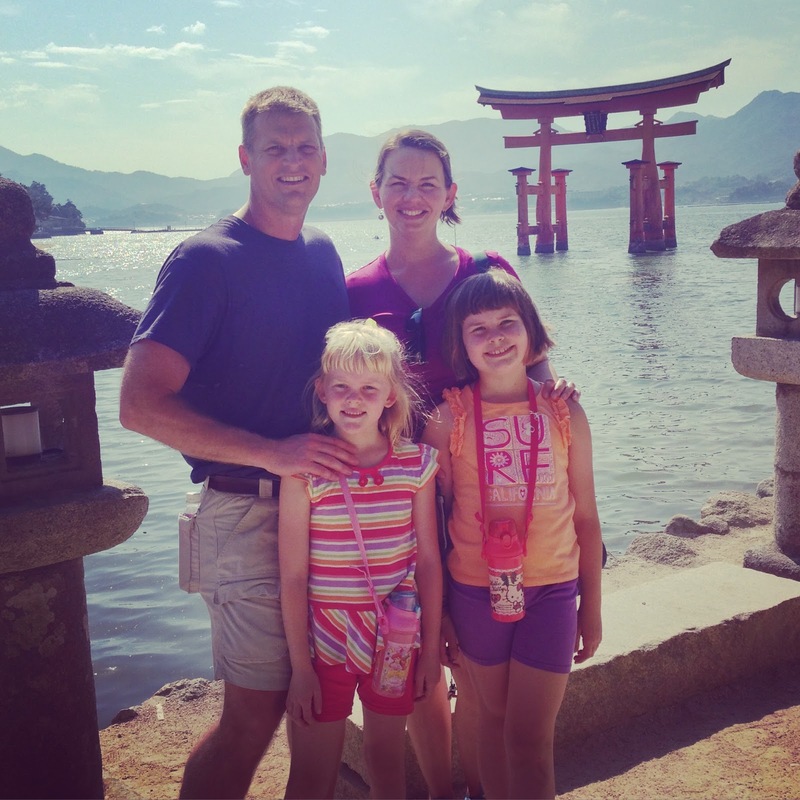 It is one of the most iconic sights in all of Japan. 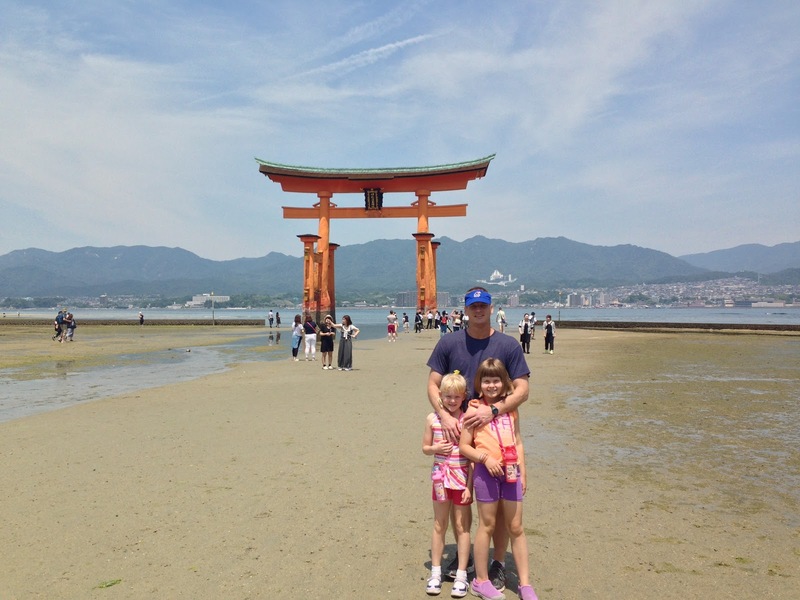 At low tide, you are able to walk right out to the gate for a close up look. 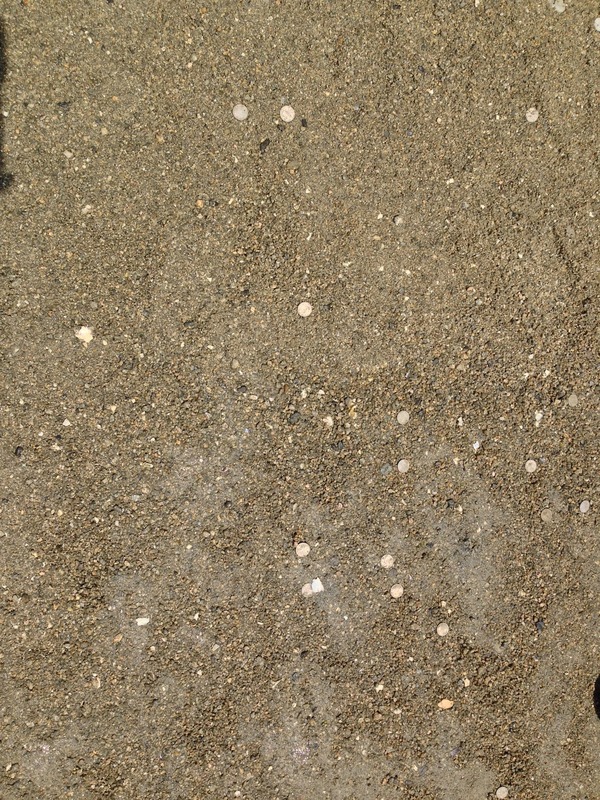 There were LOTS of coins in the sand surrounding the shrine, which gave off the most beautiful shine. 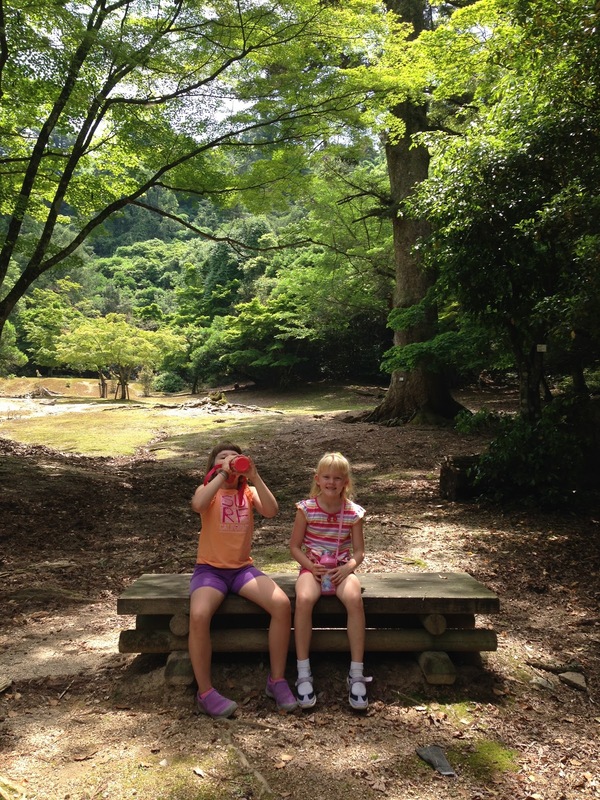 The girls thought they had struck gold! 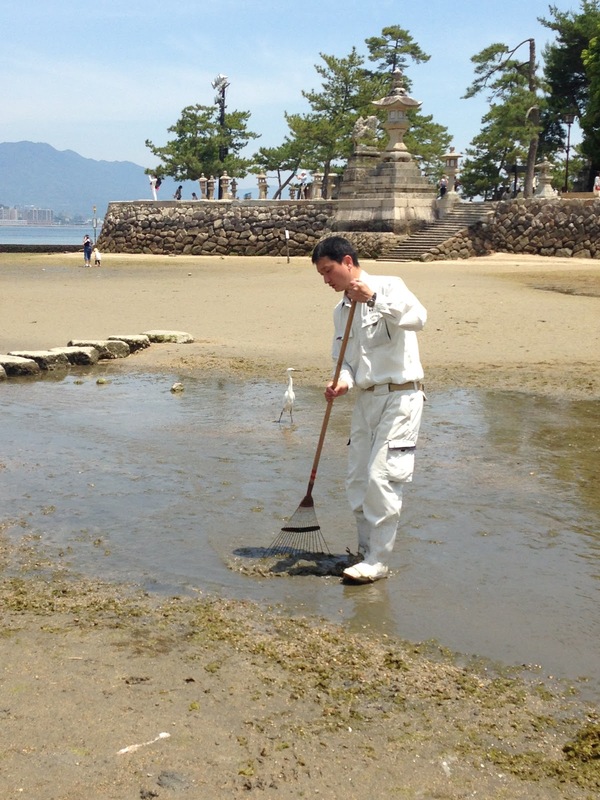 Yes, they even rake the ocean floor in Japan. I love this place! 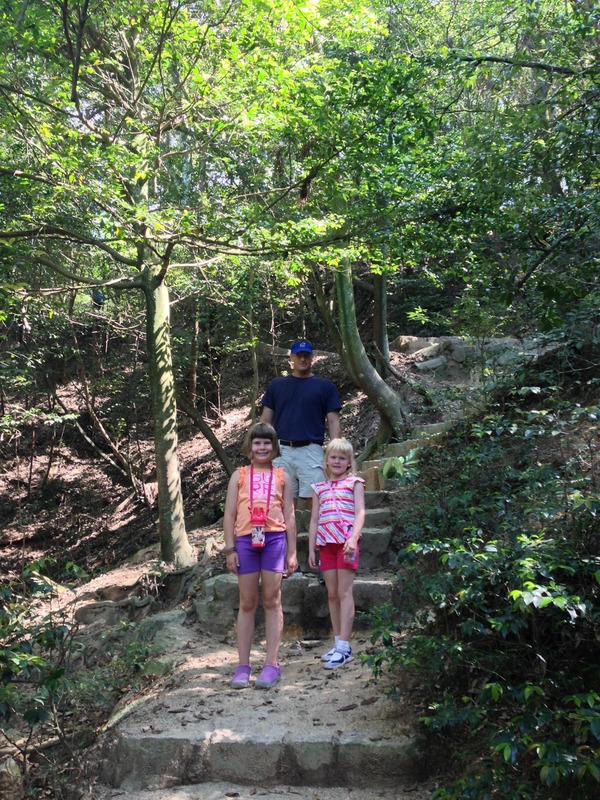 We spent the next few hours checking out some of the hiking trails. 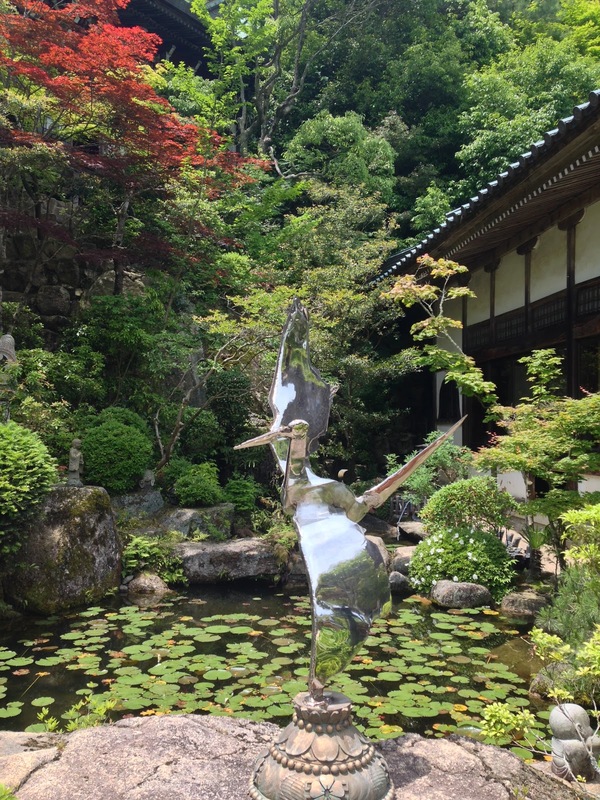 We came across some beautiful shrines and gardens. 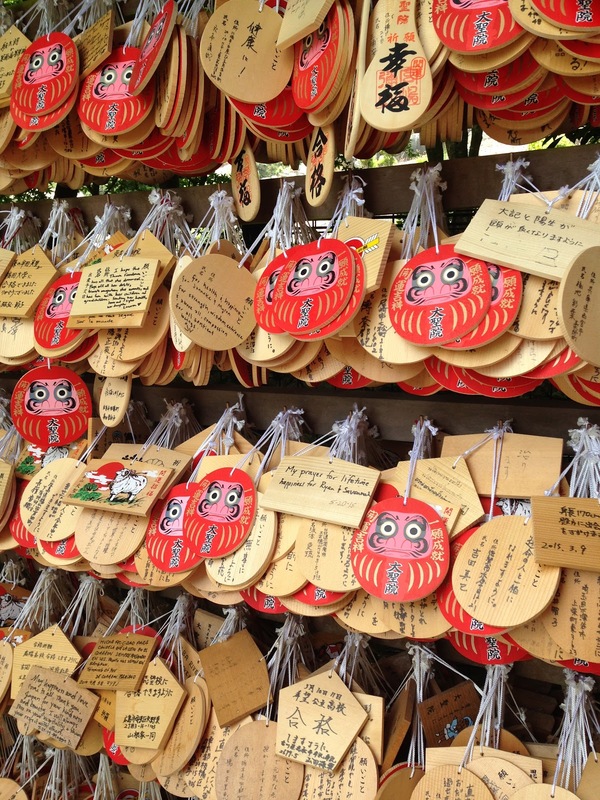 I always love the look of the wish plaques at a shrine. 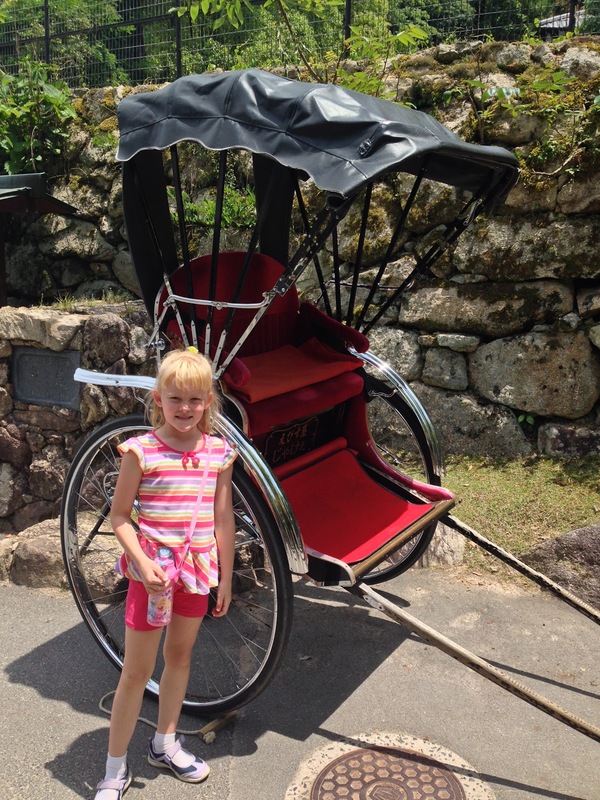 There were lots of rickshaws for hire. 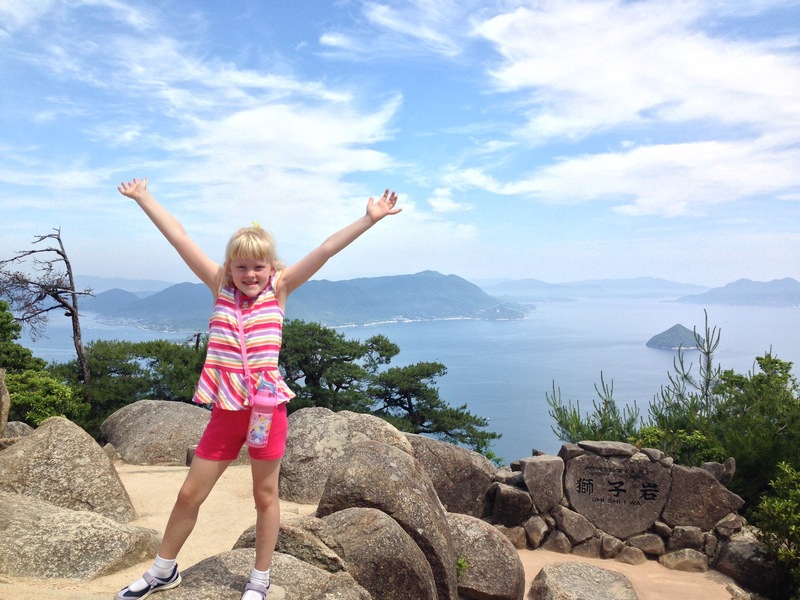 We saw one girl, running up and down the mountain all day long. What a workout! 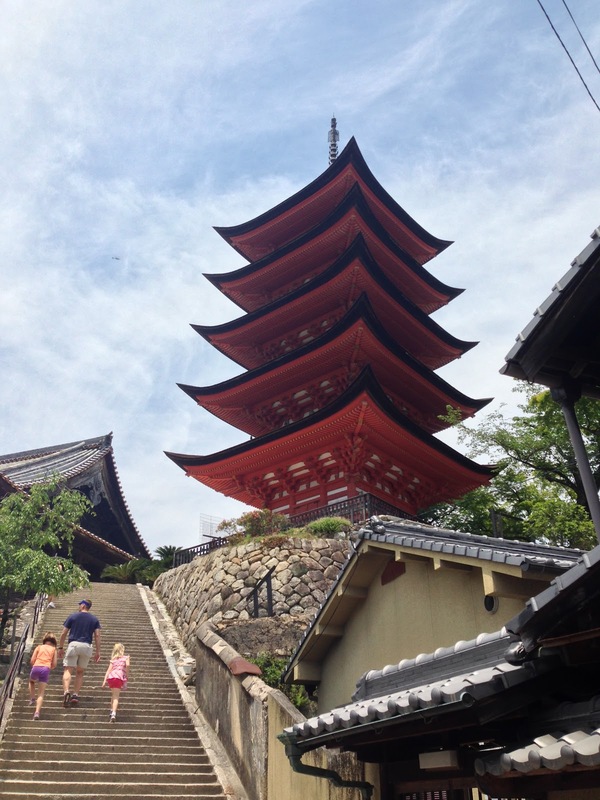 The five storied pagoda was beautiful. 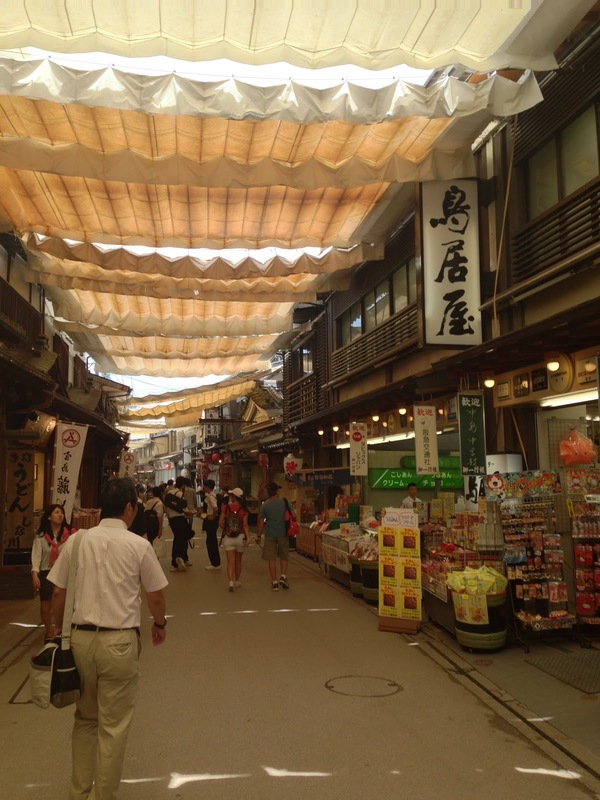 I really loved wandering the little town, too. 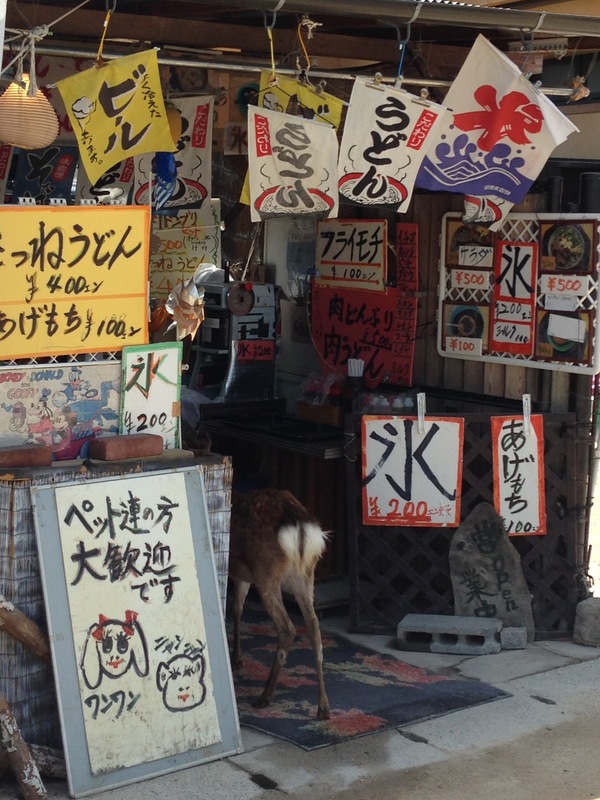 There were so many fun shops and cafes. Also notice the awnings overhead. Loved this! 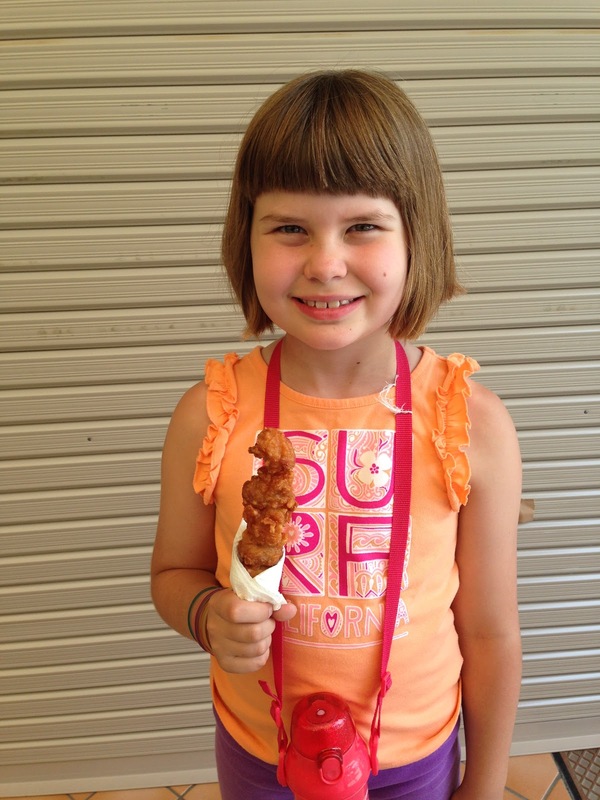 Ella chose the karage, or fried chicken on a stick, for lunch. 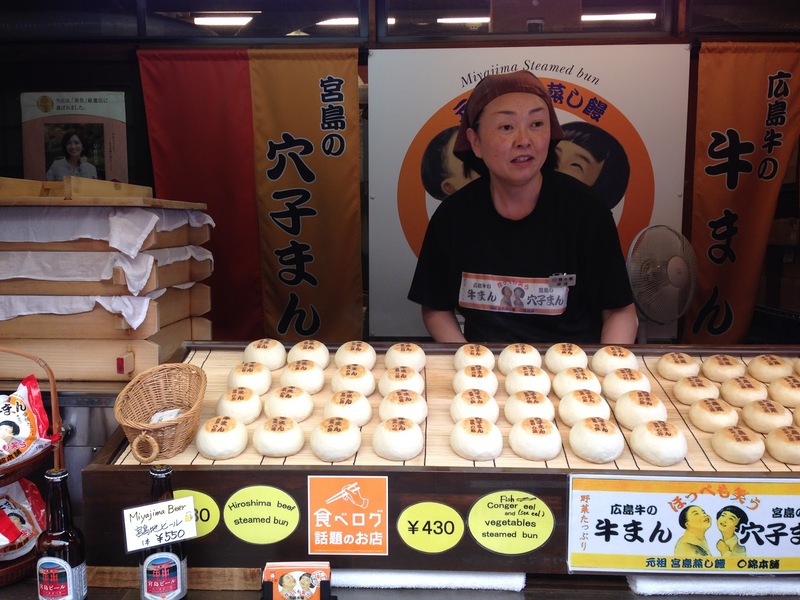 This is a pretty typical Japanese street food. I tried a beef bun, for lunch. 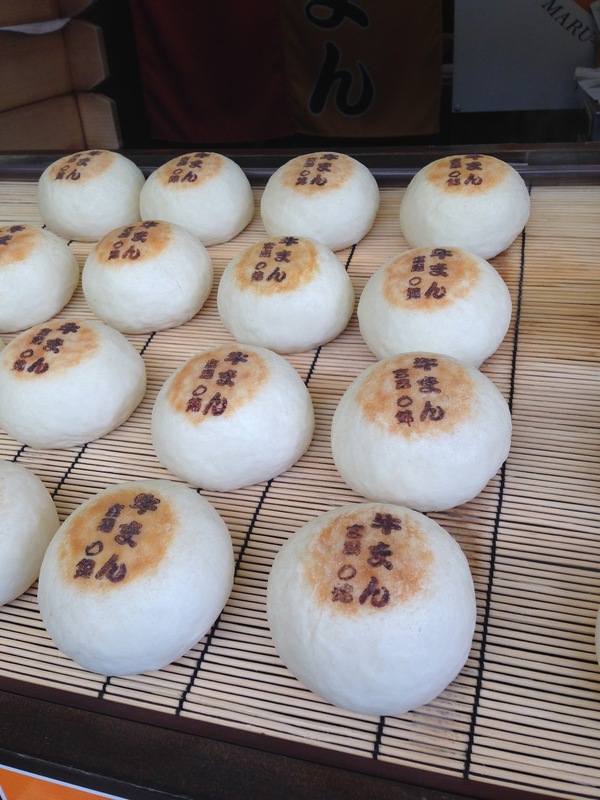 I’ve had many pork buns, but never a beef bun. 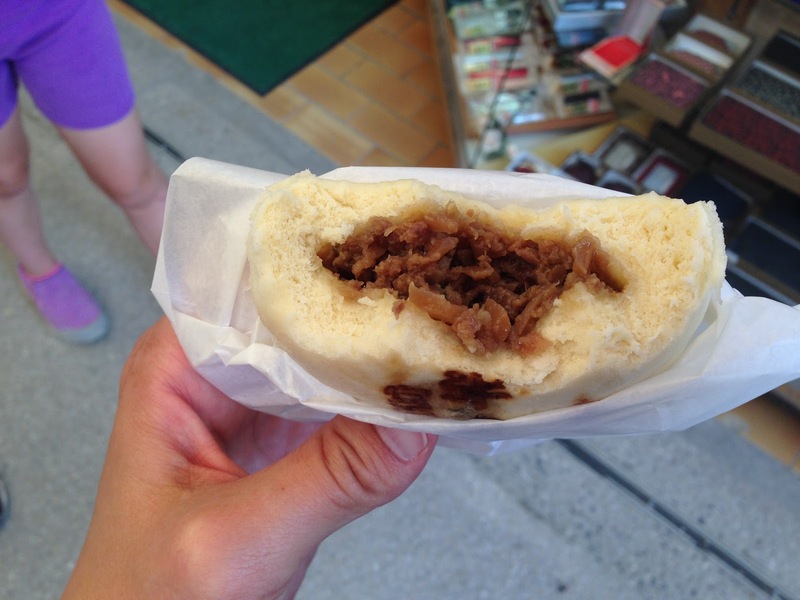 They also had eel buns….but I stuck with the beef. I loved the branding on the top, almost too pretty to eat. Good choice, it was fabulous! 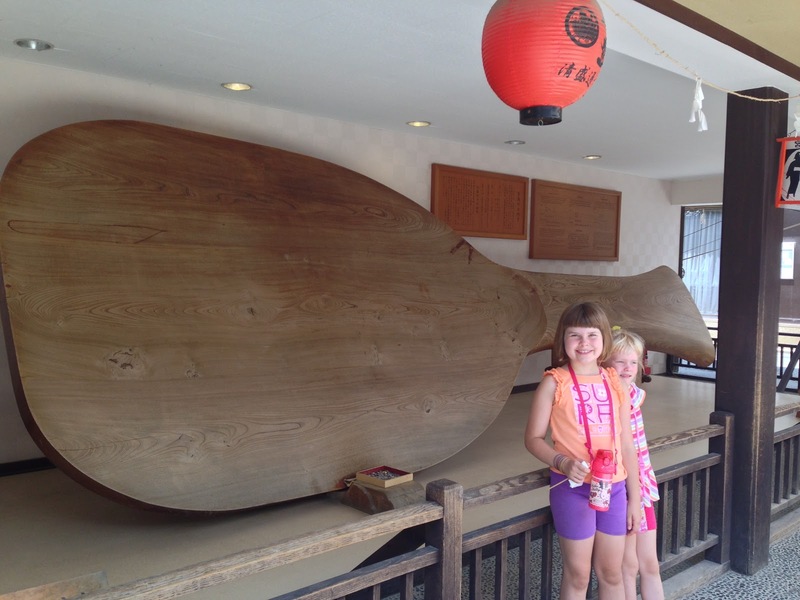 And as a bonus, we also saw the world’s largest wooden paddle! 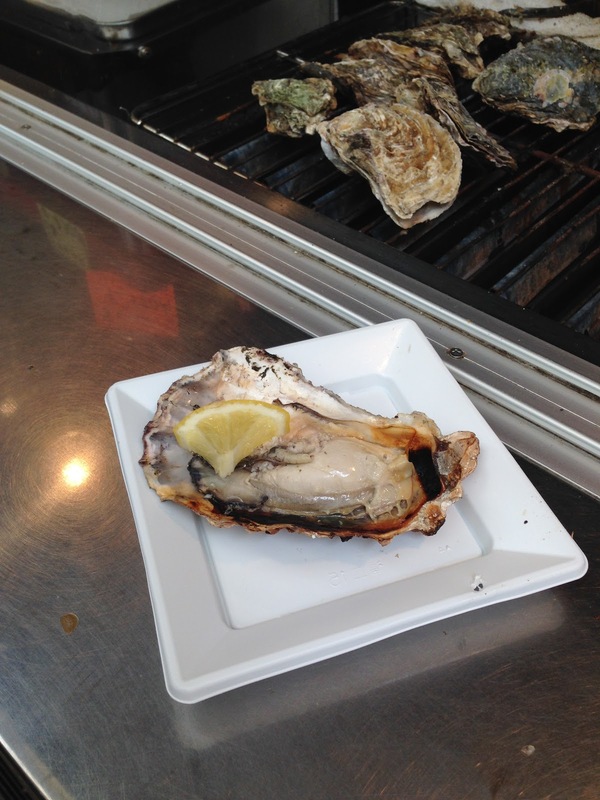 Matt decided to try an oyster, since this region is world famous for their oysters. 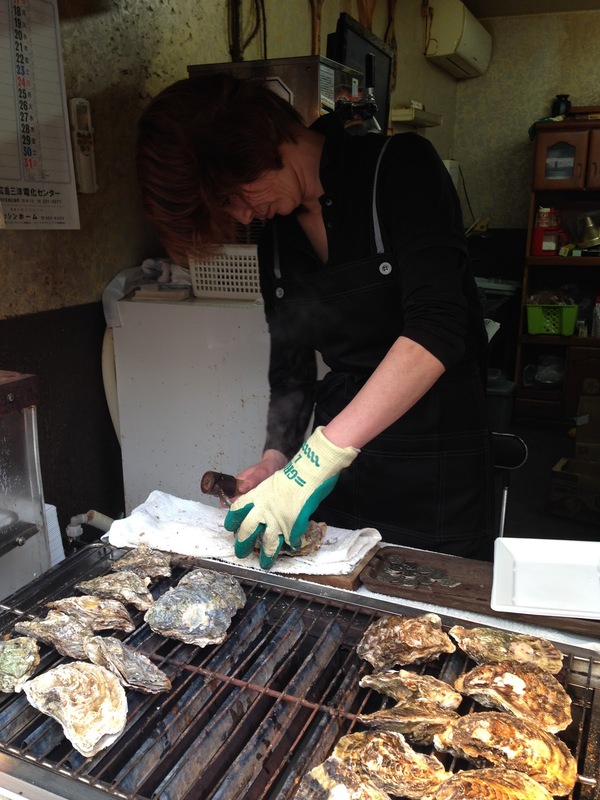 They were roasting them over a fire, and had to wear a very heavy glove to open them. Matt gave his stamp of approval. 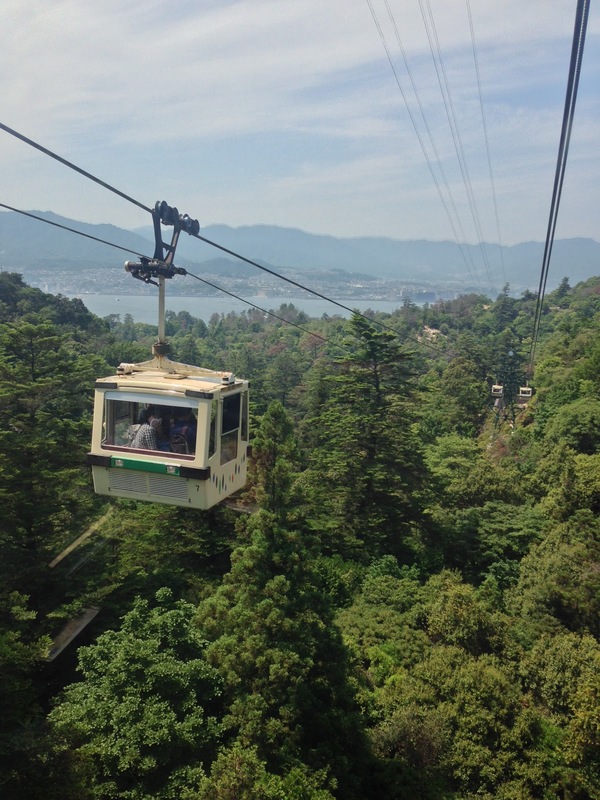 After everyone had their fill, we hiked to the gondola for a view from the top. The forests on the island have never been felled, so they are very pristine and untouched. 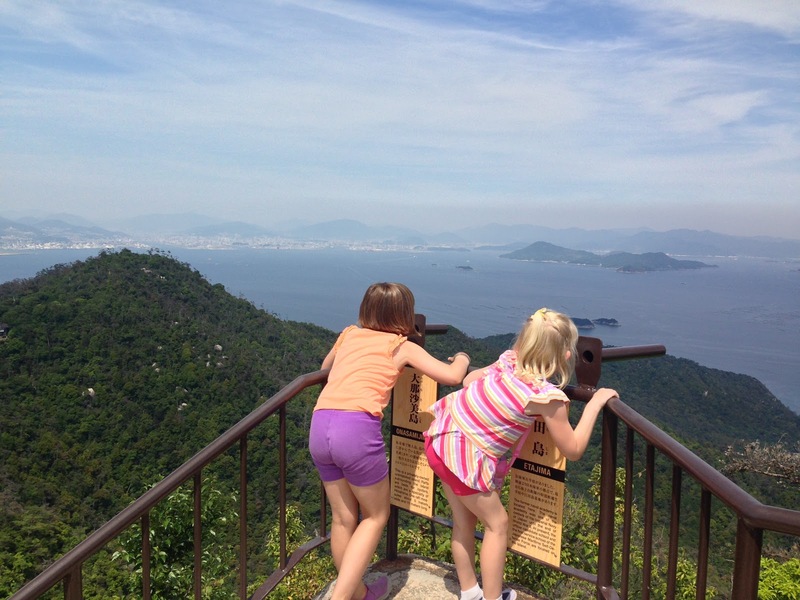 The city of Hiroshima is straight ahead, from this lookout point. The views from every angle were just spectacular, and it was such a lovely day. We couldn’t have asked for better weather. 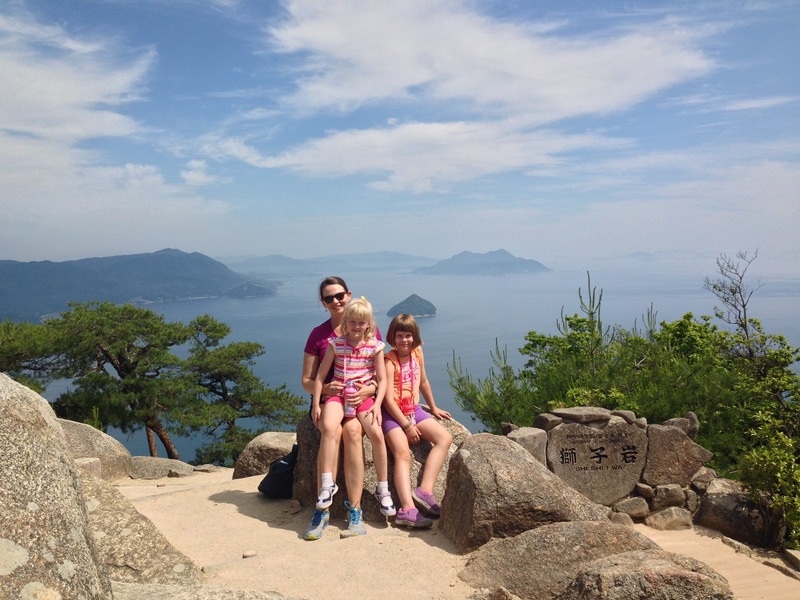 We decided to hike down, rather than take the gondola. (And, yes, Matt wanted to save the $10 per person, also.) 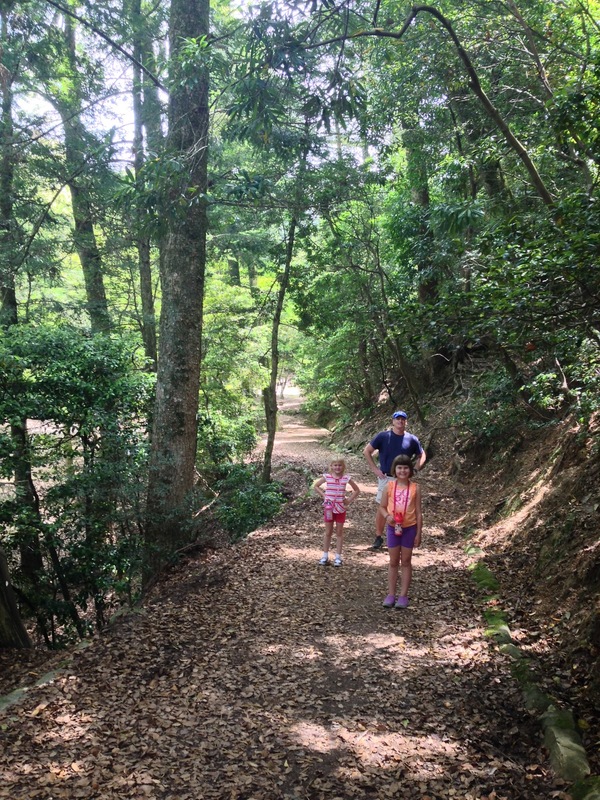 But we really enjoyed the hike. It was almost like walking down one huge staircase, literally! 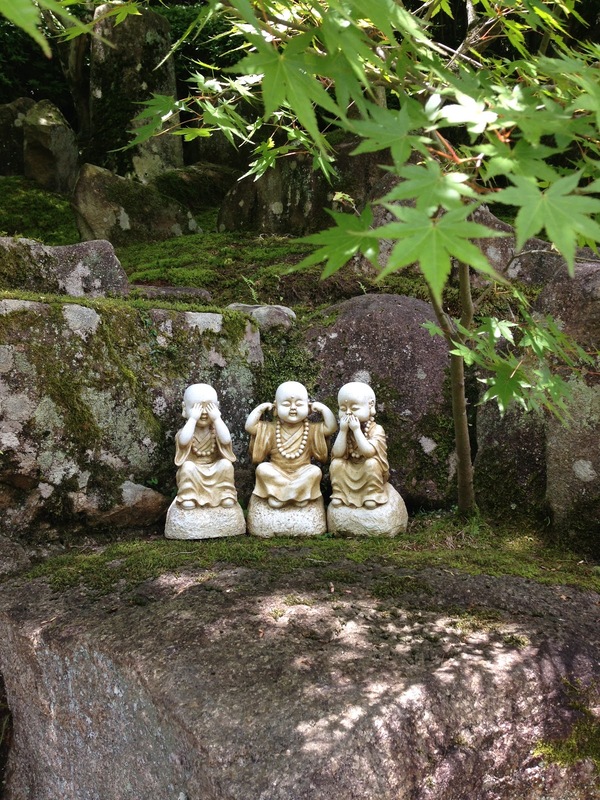 But, the surroundings were so beautiful and peaceful. The island was really well signed, and I especially liked this one. 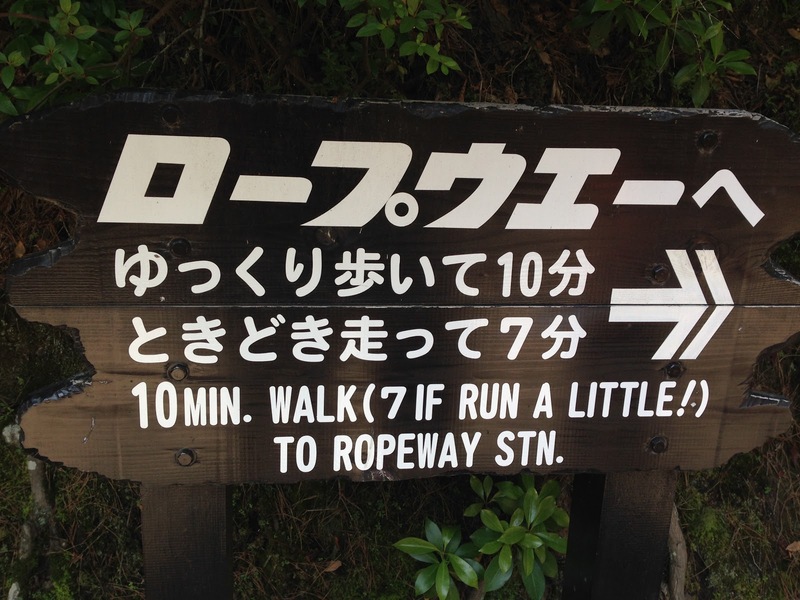 I wonder how long it takes “if run a lot”? 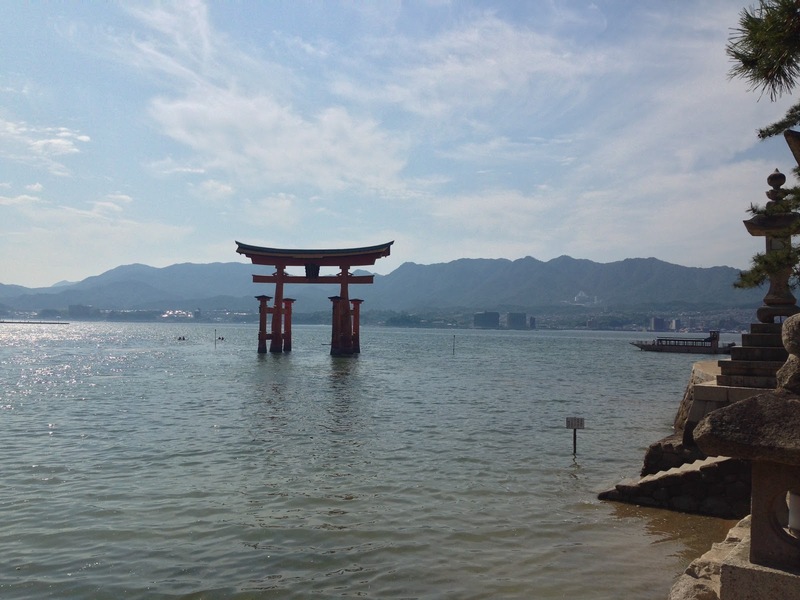 As we made our way back to the ferry terminal, the tide was much higher and the torii gate was now “floating”. This was a great lesson for the girls about the meaning of ocean tides. And one last photo op to remember an amazing day! I can see how you love that place. It is amazing. You should have ran a lot and sharpied your results on. They would love that 😉 These gals are seeing such amazing things for their age!